The Site Plan Review Committee (SPRC) – A Citizen’s Guide is an operating guide for the committee as well as an information resource for the public. These procedures are intended to facilitate the gathering of community input from the many community stakeholders impacted by site plans and to provide guidance to the Planning Commission. The Site Plan Review Committee (SPRC) was formed in the early 1970s by the County Board, and is a subcommittee of the Arlington County Planning Commission. The Planning Commission advises the Board on growth and development in the County. Under Virginia State law all local governments must appoint a planning commission to advise the governing body on development, which can have lasting implications for land use, infrastructure, economic development and community quality of life. The SPRC plays a key role in planning and guiding the successful growth and development of the County. The SPRC is the County’s way of supporting the public’s role in maintaining the vitality of its neighborhoods and corridors in response to development pressure. 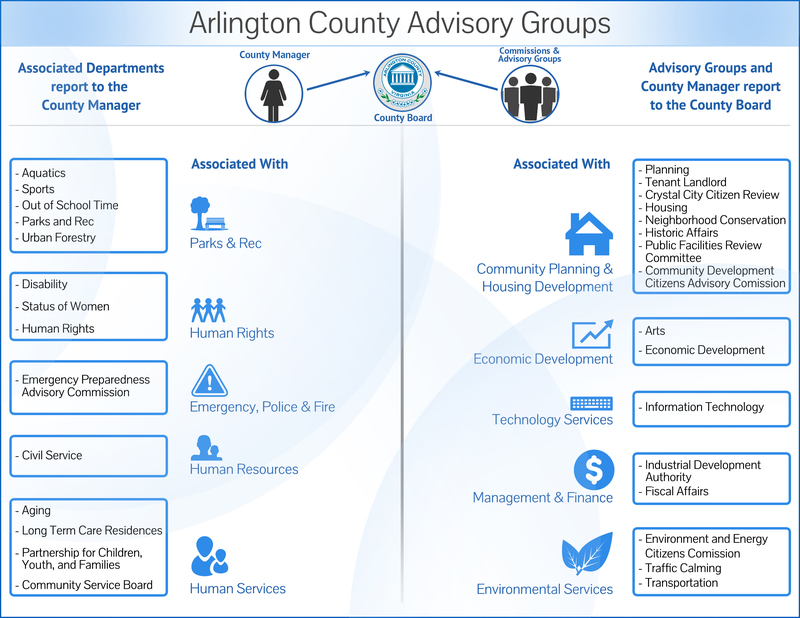 Arlington’s use of the SPRC is unique among counties in the country, and is a procedural tool that helps to implement provisions in Arlington County’s Zoning Ordinance, by coordinating citizen input in the development process. In essence, the SPRC is a discussion forum for citizen review of development projects, designed to ensure that the projects are consistent with adopted County plans and policies, its Comprehensive and other supporting planning documents, and that community and neighborhood concerns and aspirations are heard and taken into account. The County Board appoints Arlington citizens to the Planning Commission, which advises the Board. Planning commissioners, other Board-appointed commissions, County staff, developers and citizens representing civic associations and other groups active in the County come together and participate in SPRC meetings to analyze and discuss the benefits and drawbacks of a development project, and to offer suggestions on how problems, concerns and impacts that are identified might be addressed or mitigated. SPRC results are reported to the Planning Commission, which, after hearing public testimony and discussing the SPRC results during its monthly meeting, makes recommendations to the County Board, which takes final action on the site plan. This Guide explains the basic purpose of the SPRC, providing an overview of its authority, goals, procedures and the role it plays in shaping the County’s development under Arlington’s special exception site plan zoning ordinance and review process. The Guide is a revision of a previous version, and reflects the work-product of the SPRC Working Group approved by the Planning Commission in 2015. This Guide may be used as a resource for planning commissioners and other participants in the SPRC process, and can also serve as information for the general public. Included are links to further information and appendices that contain specific and/or technical information on a range of issues including: Arlington’s Comprehensive Plan and other supporting planning documents, the SPRC master agenda, list of meeting participants, and duties of the SPRC Chair. When is a Site Plan Development an Option? A site plan review is available to a developer or property owner as an alternative to what is called “by-right” zoning. In general, property owners have the right to develop and use their land as outlined in the County’s zoning ordinance. Under by-right zoning, a property may be developed under what is permissible in a given zoning district. Some zoning districts in Arlington, however, allow more intense development, i.e. greater density, height, lot coverage or other aspects of a site depending on the zoning district, in exchange for additional community amenities such as more open space, better street design, etc. This type of development is allowed by special exception or site plan as outlined in the Arlington County Zoning Ordinance. This applies to Arlington’s transit corridors and other areas planned for growth. With site plan development, the Board may approve certain modifications of the standard by-right zoning regulations, based on the criteria set forth in each zoning district. This provides the County Board with additional flexibility in order to achieve Arlington’s growth and development goals. At the same time, the site plan process provides members of the Arlington community, who may be impacted by the development project, with a voice in the process, prior to final action by the Board. The site plan process brings the property owner, County staff, and the surrounding community together in a discussion in which issues and concerns, requirements and aspirations are brought forward, examined and if possible reconciled. 1) Facilitate a discussion among property owners, staff and the impacted community. 2) Help articulate community views about the potential public impacts and benefits of a development proposal in accordance with the County’s adopted plans and policies. 3) Identify potential negative impacts on the neighborhood. 4) Suggest how such impacts may be mitigated, and how the development project might provide improvements to the public realm. 5) Develop this information for Planning Commission review and advice, and ultimately County Board action. The SPRC review is part of a more extensive County government process. A property owner or developer, the “applicant,” files a site-plan application. A time-limited process that includes an SPRC review is initiated, once an application has been accepted by the County. At the end of this process, the applicant agrees to be bound by certain conditions with regard to the construction and operation of their project which helps to preserve the public realm. The conditions, negotiated by staff and applicant, are designed to mitigate and/or improve the effects of development projects that add to the built environment in Arlington’s neighborhoods and development corridors. The “Arlington Way” is based upon the practice of intensive civic engagement, which seeks not only to inform citizens of government decisions in all areas, but also to consult with and involve them in the creation of plans and policies. SPRC reviews are conducted in this spirit of public engagement. The “Arlington Way” is at the heart of the SPRC, which provides the leadership for citizen assessment, engagement, and input on each proposed site plan project. Affected citizens and impacted communities may raise issues and concerns, and formulate a response to a project, prior to a hearing by the Planning Commission and formal action by the Board. Through the SPRC process, the County has an opportunity to identify and define concerns, issues, and aspirations among the public and ensure that developers are given a chance to respond with additional information or changes to their proposals. The SPRC convenes meetings of stakeholders including all planning commissioners, representatives of other Board appointed advisory commissions, adjacent property owners, or tenant associations. Other participants include County professional staff and the “applicant” or prospective developer of the property. In this forum, proposed projects are analyzed, explained, criticized, defended and/or modified in light of the County’s policies and plans, and in terms of the project’s compatibility with the character of existing neighborhoods and adjacent properties. The developer is responsible for providing clear exhibits and materials that illustrate the development project and support a lucid discussion of the agenda items. SPRC may defer any item for which the relevant information has not been prepared. The public is given timely notice of all SPRC meetings and is encouraged to attend. Comments from the general public may be taken at the discretion of the SPRC Chair at the end of each SPRC meeting and as time allows, giving members of public an opportunity to speak. While all SPRC meetings are noticed and public, the SPRC is more like a working group than a public hearing, where public testimony is essential and routinely taken. The SPRC convenes and leads participants in the process of site analysis, evaluation and discussion in light of the County’s adopted plans and policies. In that process, the SPRC through its Chair explores where there might be areas of consensus regarding the public value in a project, or its absence, in light of the County’s plans and policies; but also where there might be competing views and areas for further discussion that the full Planning Commission would take up at their monthly public meeting, once the SPRC has concluded. During the SPRC conversation, participants ask questions of staff and the developer, and comment on the site plan proposal. Participants are able to hear each other out and consider the positions of others at the table, including the applicant. An open, robust conversation of this kind can provide an understanding of overlapping or conflicting views. The discussion may reveal where community or neighborhood values and interests lie, and thus suggest novel areas for review and suggested modifications for a project. No votes are taken at SPRC. Rather, the intent is to explore where consensus exists. In that endeavor, the Chair may synthesize various comments and views that are presented, and ask whether those representations accurately reflect consensus and/or opposing views. Consensus, in general, is the judgment arrived at by some, many or most of the participants at the table, as the case may be, and is a coherent, citizen view expressed by informed questions and comments regarding the public value of a site plan proposal. Consensus leaves room for dissent or competing views, as well as any unresolved issues, which may ultimately be referred to the full Planning Commission for discussion after the SPRC has concluded. The SPRC discussion and analysis should strive to incorporate the highest and best principles of urban design. These principles, embodied in the County’s planning documents, are intended to enhance the beauty, livability, accessibility and security of the public realm, its open spaces and streetscapes; and to reinforce the identify of its neighborhoods, while integrating development, including private development and public facilities, while sustaining natural areas. The County relies upon professional staff as it reviews development projects. The Planning Division’s Urban Design and Research team participates in SPRC reviews. SPRC discussions are really exercises in design review. According to the American Planning Association’s Design Review: Guiding Better Development report, design review allows a community to better achieve its goals for economic development. It protects valuable environmental assets, strengthens neighborhoods, and enhances the overall image of the community for both residents and visitors. It can help demonstrate that the community can accommodate development while at the same time reflect shared values and attributes. It allows for engaging the public in decisions regarding incremental changes to the community and enables them to express ideas about how individual projects can contribute to the community as a whole. The SPRC works closely with staff on all aspects of a site plan project, and with staff ensures that the project is consistent with the County’s adopted plans and policies and the adequacy of the proposed conditions and other amenities that mitigate the effect of development on the public realm. However, the SPRC plays a role different from professional staff. The SPRC, through its leadership of the community conversation, must identify community interests and neighborhood needs and concerns. The Planning Commission and County Board will thus be provided with a rich assortment of professional and public concerns and aspirations, and will be in a better position to balance private and public value. Finally, SPRC reviews may surface concerns with adopted development plans and policies, which may be out of date, or do not take into account of the challenges of more recent growth trends. While the SPRC reviews must follow and outline consistencies or deviations from adopted plans and policies, on occasion the reviews can indicate whether such policies might themselves be due for review or modification by the Board. Provide a forum for community review of a development project in which property owners, staff, planning and other commissions, citizen and community groups collaboratively examine and comment on a project filed under Arlington’s special exception site-plan regulation. Provide views about whether the site-plan project adequately reflects the County’s Comprehensive Plan, relevant sector plans including those for Arlington’s Metro station areas, as well as other County plans and policies. Ensure that the developer provides clear exhibits regarding all agenda items. Evaluate whether a high quality of land use planning and other amenities that mitigate any negative public realm impacts are incorporated into the site plan project. Work to identify consensus and competing views of the site plan project, and refer any outstanding issues to the Planning Commission for consideration at its monthly meeting. Determine whether County plans and policies have been adequately reflected in the development proposal, and if not, what further initiatives could be recommended by the Planning Commission that would further County development goals. Report the results of the SPRC discussion to the Planning Commission in its public review of the site plan project including a discussion agenda and outline of potential motions.